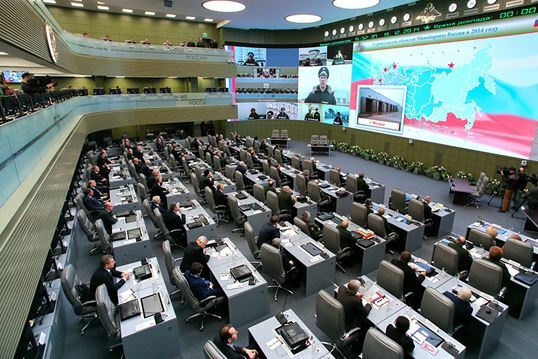 Krasnaya zvezda called this story “Year of Accomplishments,” but might have called it Day of Military Acceptance . . . .
President and Supreme CINC Vladimir Putin visited the NTsUO for the first time on 18 December. 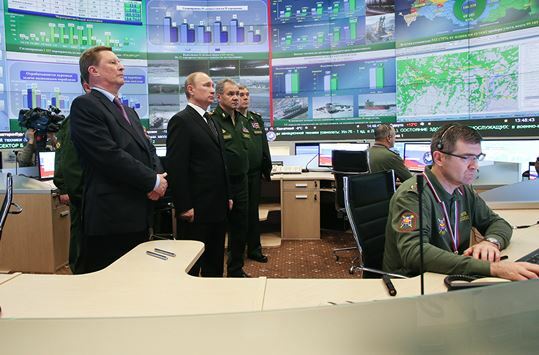 He familiarized himself with the new national command center and its capabilities for accommodating and coordinating the work of the military and other high-level government organs. Putin’s seat is in the upper balcony opposite the big screens. The first real order of business, however, was reviewing fulfillment of the State Defense Order in 2014. Recall this year the political leadership and Defense Ministry launched a quarterly exercise of enumerating what was procured the previous three months on what they call the Day of Military Acceptance (День военной приёмки). It’s almost as though the Kremlin is irritated someone has audaciously suggested that Russian output of new armaments and other military equipment hasn’t been especially impressive in years past. 7 modernized Tu-160 and Tu-95MS bombers. It isn’t clear which four submarines the Russian president means. Probably the third Borey-class (proyekt 955A) SSBN Vladimir Monomakh and Improved Kilo-class (proyekt 636.3) diesel-electric Novorossiysk. But Borey unit 2 Aleksandr Nevskiy was accepted late last year. And it would be a stretch to accept the next two Improved Kilos before January. KZ then turns to Defense Minister Sergey Shoygu and his words before an expanded MOD collegium in the NTsUO. Shoygu said Russia’s 14 UAV sub-units (companies or platoons) received 179 UAVs. 5 surface ships and 10 boats / craft of various classes. This account mentions that the serviceability of weapons and equipment rose from 80 to 85 percent. Accepting submarines at year’s end seems to enable Moscow to claim that they were accepted, or to count them as “produced,” in two years rather than just one. All in all, more weapons and equipment were acquired in 2014 and 2013 than in 2012, 2011, etc. But it’s a little like comparing something and nothing. Serious procurement on a fairly wide front didn’t begin until after 2012. This entry was posted in Command and Control, Force Modernization and tagged Gosoboronzakaz, GOZ, NTsUO, Procurement, State Defense Order. Bookmark the permalink. I remember 2012 being the first year when the air force took delivery of a large number of fixed wing aircraft, 38 IIRC. That increased to 68 last year and a somewhat incredible 142 in 2014. Does that include modernized aircraft? I think there were statements to the effect that around 100 newly built fixed wing aircraft entered service this year. Is there any info on plant/facility upgrades? They seemed to break out mod a/c separately. It could be 100 new fixed wing a/c, but one would need more time to count it out. They seem to be making do with existing plant and capital equipment. Improvement in the industrial base seems slower than in production itself. As one rereads one’s rather faithful rendition of the sources, we can say that the 142 a/c definitely includes the mod MiG-31BMs. It might be hard to break the 100-new-aircraft mark. “Accepting submarines at year’s end seems to enable Moscow to claim that they were accepted, or to count them as “produced,” in two years rather than just one” – what do you mean? That’s a fair question…it’s not obvious until you get pretty far into what was printed. Shoygu counted Borey hull 1 Yuriy Dolgorukiy because it entered into the Navy’s permanent readiness forces. He said the Navy will have three Boreys by the end of 2014 — so he is including hull 2 Nevskiy and 3 Monomakh. But Dolgorukiy and Nevskiy were both commissioned in 2013. So we come round again to which 4 subs — Monomakh, Novorossiysk, and what? Would not be surprised to see Nevskiy counted as produced in 2014 although it was commissioned in December 2013 and counted in 2013’s recap of military production. Similarly, Monomakh will be counted for 2014 and possibly for 2015 too. Mil.ru is more egregious — Yasen hull 1 Severodvinsk was counted against 2013 (it was commissioned on 30 December), but the MOD website also includes it in 2014’s enumeration of weapons systems produced. The other 48 are Su-25SM3, Su-27SM, and MiG-31BM, and various Tupolev heavu bomber upgrades. I believe 12 Su-25SM3’s, 8 Su-27SM2’s, 7 heavy bombers, and the rest are MiG-31’s that saw upgrade. Overall a phenomenal year and 2015 is supposed to be bigger with total count going to about 160 aircraft. This doesn’t even include all the specialty Borts for Rossiya and the other power ministries which took on a number of new Tu-204/214’s, SSJ’s, and even 1 Il-96. Rossiya has so many aircraft now its almost Qatar Airways size. The submarine numbers probably include the 2 specialized deep diving mini-subs for that rescue ship they inducted this year…. Su-30MK2? Did you mean the Su-30M2? Do you have a source for the Su-27SM? According to the MoD report, 18 upgraded Foxhounds were handed over, not 21. Thanks for the a/c data. Are you referring to the Bester-1 for the new Igor Belousov sub rescue ship? Belousov was supposed to be accepted in 2014, but state testing for it and for Bester-1 was put off until early 2015.